A crater lake is a lake that forms in a volcanic crater or caldera less commonly and with lower association to the term a lake may form in an impact crater caused by a meteorite, or in an artificial explosion caused by humans. 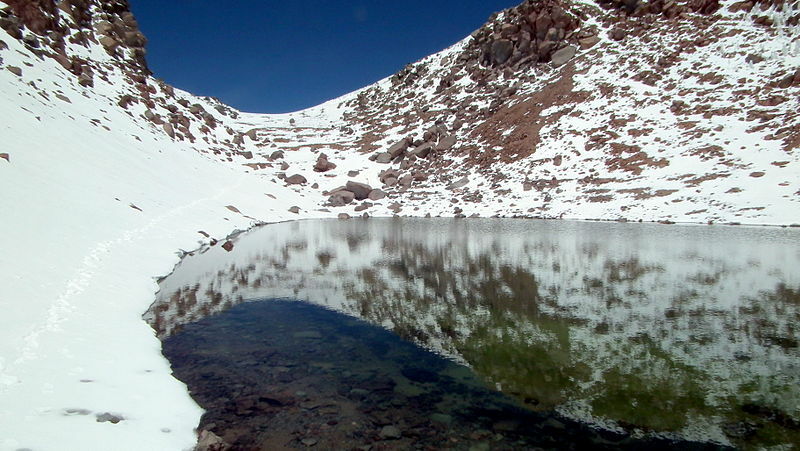 Sometimes lakes which form inside calderas are called caldera lakes, but often this distinction is not made. 1. "Crater Lake, Mount Mazama – Oregon, USA"
Mount Mazama is a destroyed stratovolcano in the Oregon part of the Cascade Volcanic Arc and the Cascade Range located in the United States. 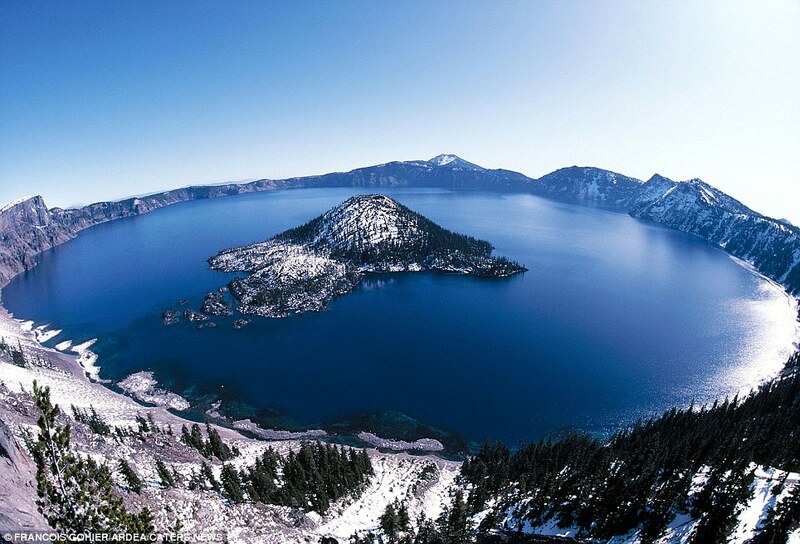 The volcano's collapsed caldera holds Crater Lake, and the entire mountain is located within Crater Lake National Park. Crater Lake is fed solely by falling rain and snow, with no inflow or outflow at the surface, and hence is one of the clearest lakes in the world. 2. 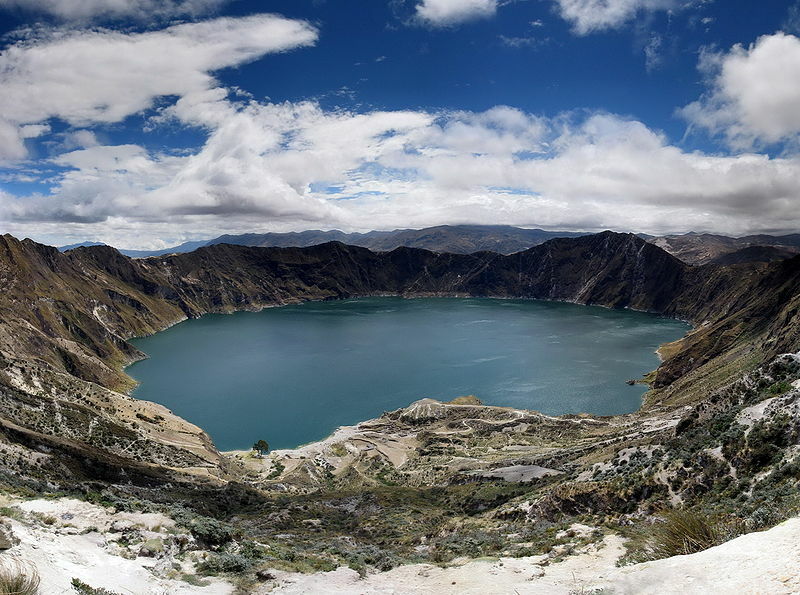 "Quilotoa Crater Lake – Ecuador"
Quilotoa is a water-filled caldera and the most western volcano in the Ecuadorian Andes. The 3 kilometres (2 mi) wide caldera was formed by the collapse of this dacite volcano following a catastrophic VEI-6 eruption about 800 years ago, which produced pyroclastic flows and lahars that reached the Pacific Ocean, and spread an airborne deposit of volcanic ash throughout the northern Andes. The caldera has since accumulated a 250 m (820 ft) deep crater lake, which has a greenish color as a result of dissolved minerals. 3. 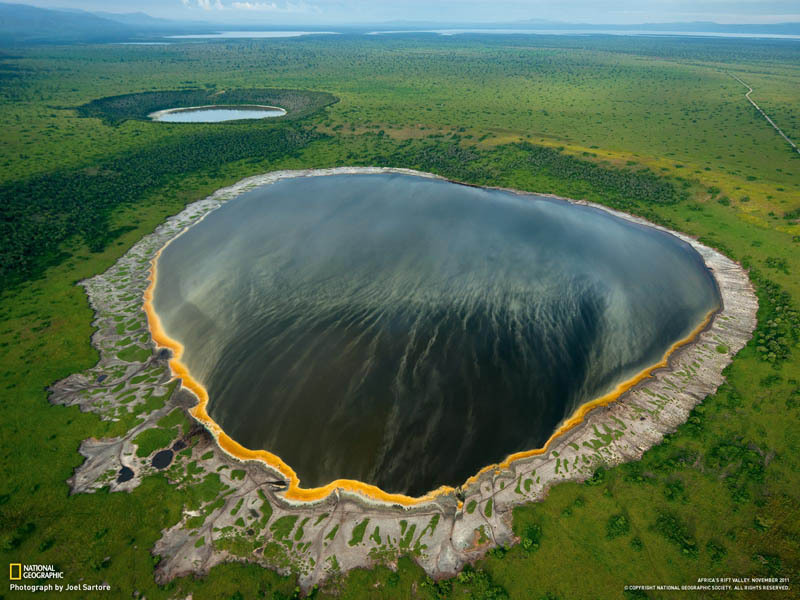 "Crater Lakes in the Albertine Rift – Africa"
In a region bursting with people, a few big open spaces remain—like the Rift floor in Queen Elizabeth Park, pocked with crater lakes formed by volcanic explosions. The Western Rift, also called the Albertine Rift, is edged by some of the highest mountains in Africa, including the Virunga Mountains, Mitumba Mountains, and Ruwenzori Range. It contains the Rift Valley lakes, which include some of the deepest lakes in the world (up to 1,470 metres (4,800 ft) deep at Lake Tanganyika). Much of this area lies within the boundaries of national parks such as Virunga National Park in the Democratic Republic of Congo, Rwenzori National Park and Queen Elizabeth National Park in Uganda, and Volcanoes National Park in Rwanda. All of the African Great Lakes were formed as the result of the rift, and most lie within its rift valley. 4. "Kelimutu Crater Lake – Flores Island, Indonesia"
Kelimutu volcano contains three striking summit crater lakes of varying colors. Tiwu Ata Mbupu (Lake of Old People) is usually blue and is the westernmost of the three lakes. The other two lakes, Tiwu Nuwa Muri Koo Fai (Lake of Young Men and Maidens) and Tiwu Ata Polo (Bewitched or Enchanted Lake) are separated by a shared crater wall and are typically green or red respectively. 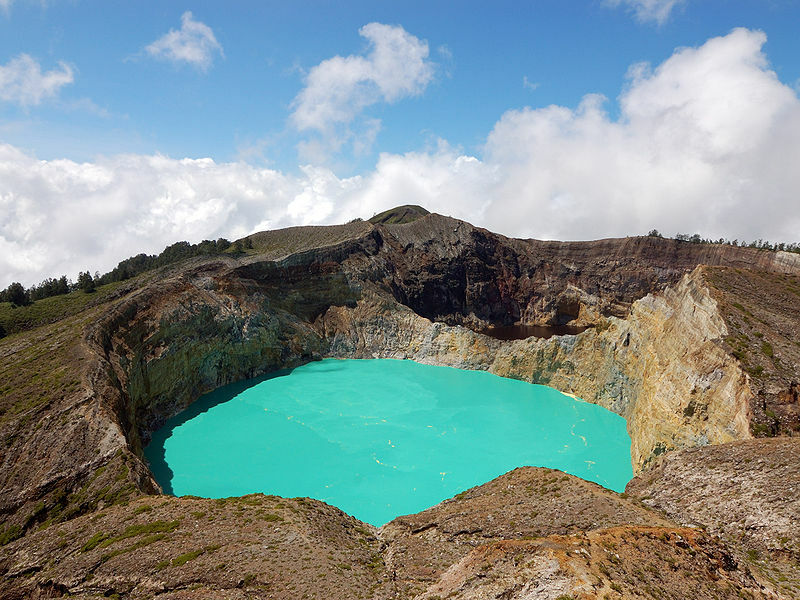 Kelimutu is of interest to geologists because the three lakes are different colors yet are at the crest of the same volcano. 5. 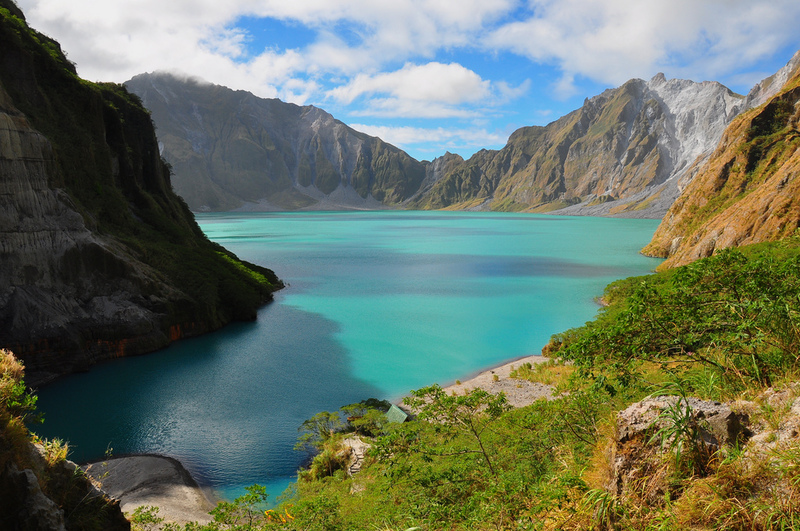 "Crater Lake, Mount Pinabuto – Luzon, Philippines"
Lake Pinatubo is the summit crater lake of Mount Pinatubo formed after its climactic eruption on June 15, 1991. The lake is located near the boundaries of Pampanga, Tarlac and Zambales provinces in the Philippines and is the deepest lake in the country at 800 m (2,600 ft). It is about 90 km (56 mi) northwest of the capital city of Manila. 6. "Crater Lake (Okama), Mt. Zao – Honshu, Japan"
Mount Zao is a complex volcano on the border between Yamagata Prefecture and Miyagi Prefecture in Japan. It consists of a cluster of stratovolcanoes and is the most active volcano in northern Honsh?. The central volcano of the group includes several lava domes and a tuff cone, Goshiki-dake, which contains a crater lake named Okama. Also known as the ‘Five Color Pond’ because it changes color depending on the weather, it lies in a crater formed by a volcanic eruption in the 1720s. The lake is 360 metres (1,200 ft) in diameter and 60 m (200 ft) deep, and is one of the main tourist attractions in the area. 7. 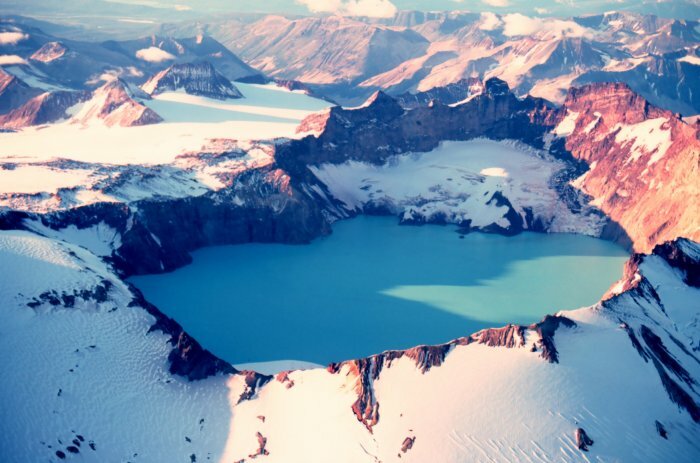 "Crater Lake, Mount Katmai – Alaska, USA"
Mount Katmai is a large stratovolcano (composite volcano) on the Alaska Peninsula in southern Alaska, located within Katmai National Park and Preserve. It is about 6.3 miles (10 km) in diameter with a central lake-filled caldera about 3 by 2 mi (4.5 by 3 km) in area, formed during the Novarupta eruption of 1912. The caldera rim reaches a maximum elevation of 6,716 feet (2,047 m). In 1975 the surface of the crater lake was at an elevation of about 4,220 feet (1,286 m), and the estimated elevation of the caldera floor is about 3,400 ft (1,040 m). The mountain is located in Kodiak Island Borough, very close to its border with Lake and Peninsula Borough. 8. 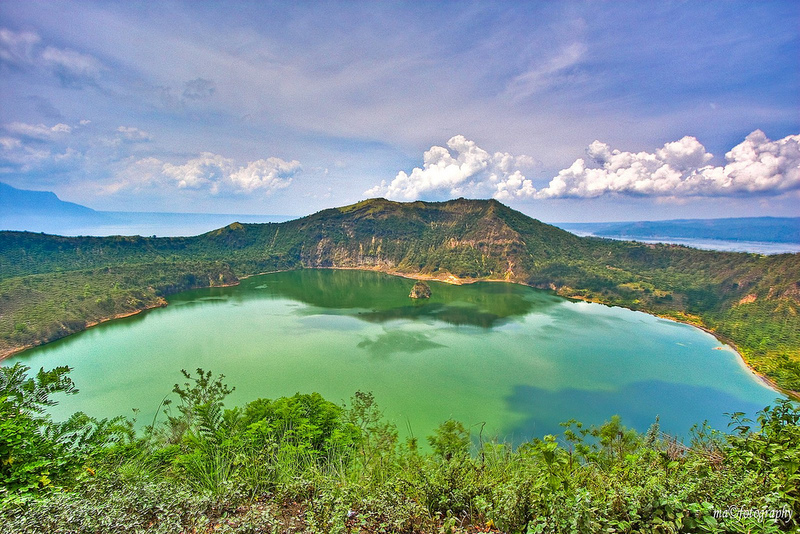 "Vulcan Point within Crater Lake, Taal Volcano – Luzon, Philippines"
9. "Deriba Crater Lake, Jebel Marra – Darfur, Sudan"
Deriba Crater is at the highest point of Jebel Marra at an elevation of 3,042 m (9,980 ft), in Darfur in the western part of Sudan. The caldera rim became Sudan’s new highest point, after the independence of South Sudan. It is between 5 km and 8 km in diameter across the outer crater. The inner crater is filled by a crater lake. 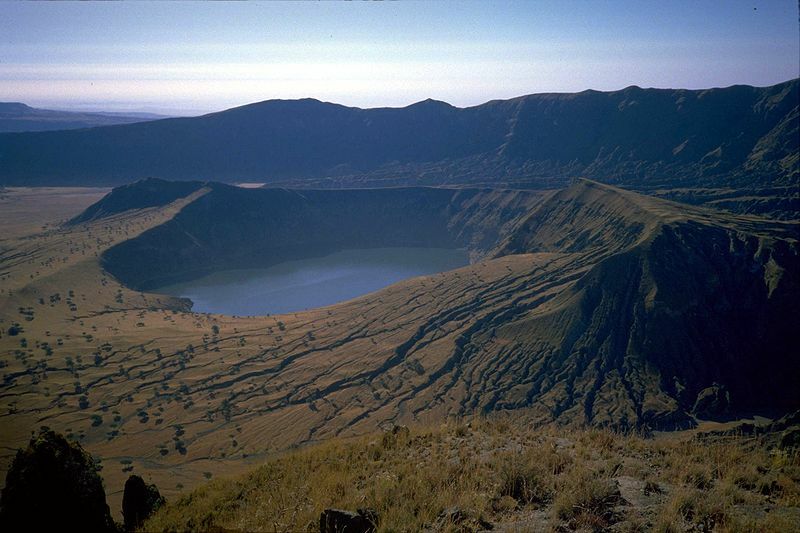 The 5-kilometer-wide Deriba Caldera was formed by explosive eruption of the Jebel Marra Volcano approximately 3,500 years ago. The volcano is considered dormant, rather than extinct, as hot springs and fumaroles (gas and steam vents) are still present. 10. 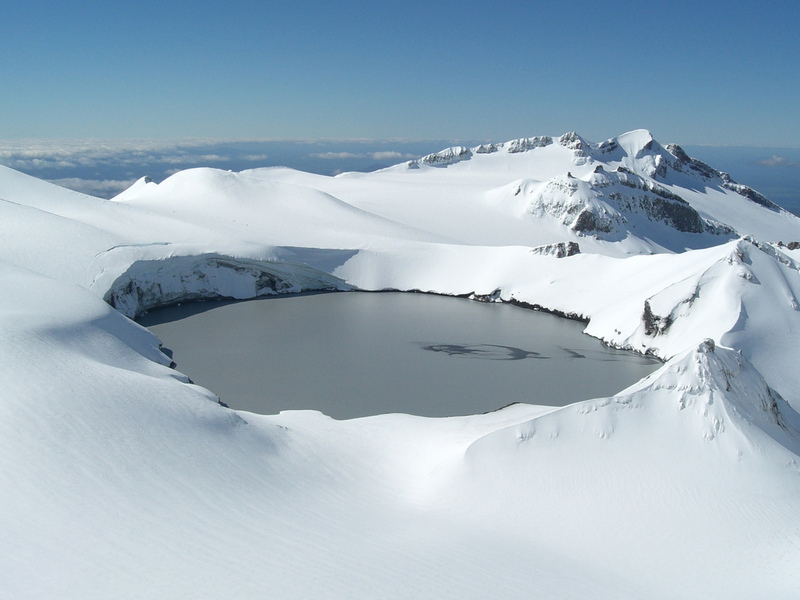 "Crater Lake, Mount Ruapehu – New Zealand"
Ruapehu is one of the world’s most active volcanoes and the largest active volcano in New Zealand. It is the highest point in the North Island and includes three major peaks: Tahurangi (2,797 m), Te Heuheu (2,755 m) and Paretetaitonga (2,751 m). The deep, active crater is between the peaks and fills with a crater lake between major eruptions. 11. "Crater Lake, Licancabur – Chile"
Licancabur is a highly symmetrical stratovolcano on the southernmost part of the border between Chile and Bolivia. It is located just southwest of Laguna Verde in Bolivia. The summit and the crater are located entirely in Chile, slightly over 1 km (3,281 ft) to the south west of the international borders, it is about 400 m (1,312 ft) wide and contains a 70 m (230 ft) by 90 m (295 ft) crater lake, Licancabur Lake, which is ice-covered most of the year. This is one of the highest lakes in the world, and despite air temperatures which can drop to -30 °C, it contains planktonic fauna. 12. "Heaven Lake, Baekdu Mountain – China, North Korea"
Heaven Lake is a crater lake on the border between China and North Korea. 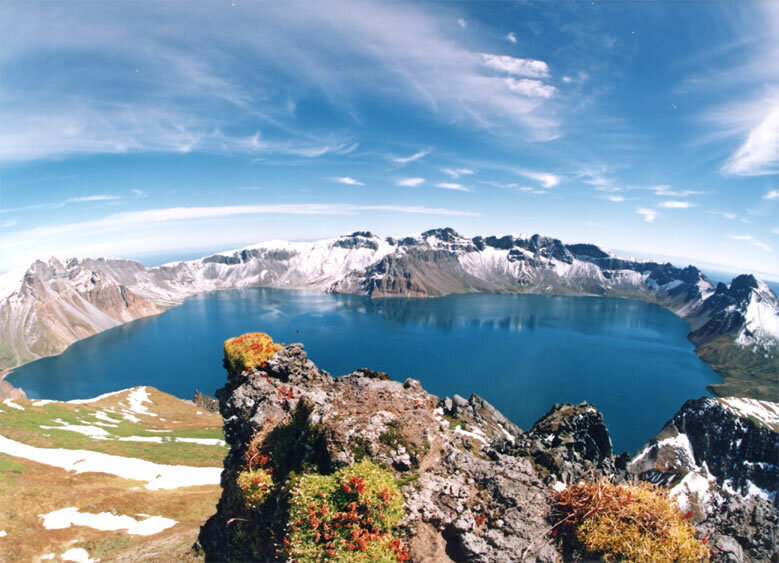 It lies within a caldera atop the volcanic Baekdu Mountain, a part of the Baekdudaegan mountain range and the Changbai mountain range. It is located partly in Ryanggang Province, North Korea, at 42.006°N 128.057°E, and partly in Jilin Province, northeastern China. 13. "Lonar Crater Lake - India"
Lonar Lake is a saline soda lake located at Lonar in Buldana district, Maharashtra, India, which was created by a meteor impact during the Pleistocene Epoch. This lake, which lies in a basalt impact structure, is both saline and alkaline in nature. 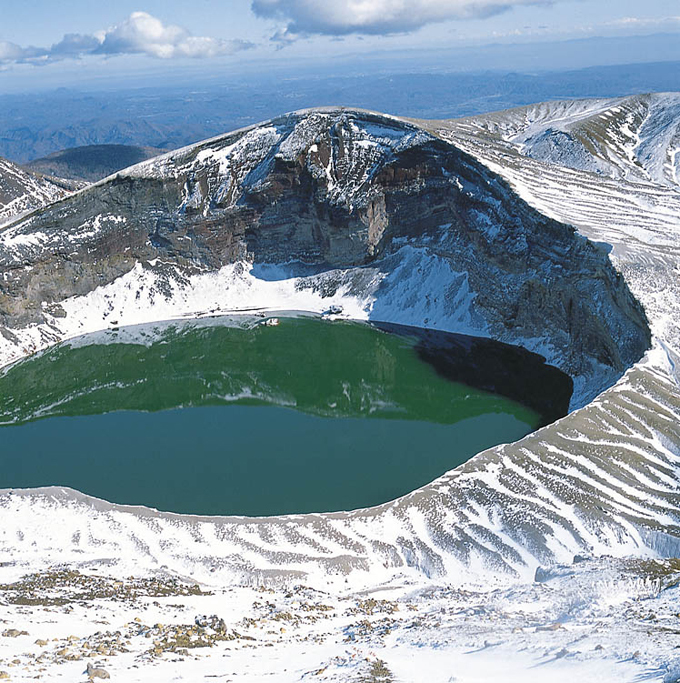 Geologists, ecologists, archaeologists, naturalists and astronomers have reported several studies on the various aspects of this crater lake ecosystem. 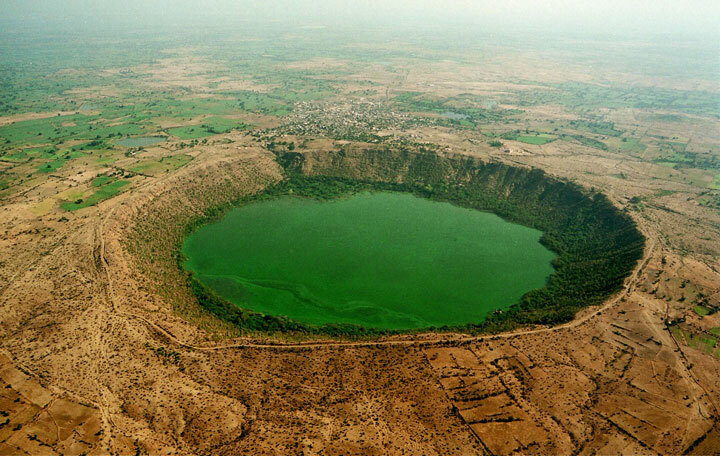 Lonar Lake has a mean diameter of 1.2 kilometres (3,900 ft) and is about 137 metres (449 ft) below the crater rim. The meteor crater rim is about 1.8 kilometres (5,900 ft) in diameter.